The reverse mortgage becomes due when the last borrower passes away or leaves the home as their primary residence. Understandably, the borrower’s heirs are often concerned with their responsibilities in settling the reverse mortgage loan. Adult children of potential reverse mortgage borrowers should discuss the financial options open to their parents. 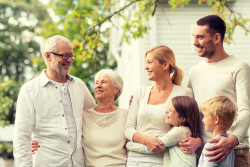 In many cases, a reverse mortgage is the smart choice for both the borrowers and their children. First and foremost, they should know that the estate and the heirs will never owe more than the home is worth. As an heir to a reverse mortgage property, what are my options? Once the last borrower passes or ceases to live in the home as a primary residence, the reverse mortgage becomes due. Adult children and other non-spouse heirs are required to settle the loan. They can pay off the loan; potentially through obtaining a new mortgage and keep the property. They can sell the property and settle the loan with the proceeds and keep whatever extra equity remains, or turn the property over to the lender. This decision is usually contingent upon the amount of equity left in the home at the time the reverse mortgage becomes due. If the heirs decide to sell the property, how long do they have to complete the sale? Heirs are given an initial six months to decide on a course of action with the loan. Two separate 3 month extensions are available, upon approval from the loan servicer. It is to their advantage to act as quickly as possible because interest continues to accrue until it’s paid off, as with any loan. Heirs may want to hold out for the right buyer or perform home improvements in order to increase equity before they sell. The lender will want to see that the heirs are actively pursuing a sale of the property and will allow the heirs this time to maximize the equity in the house. What if the property has lost value during the course of the loan? The good news for heirs is that reverse mortgages are designed to be “nonrecourse” loans. That means if the loan amount exceeds the home’s value, the lender cannot go after the rest of the estate or the heirs’ other assets for payment. The estate can never owe more than the value of the property. If the home is sold and the balance of the reverse mortgage loan is more than the sale price of the home, the Department of Housing and Urban Development (HUD) will not hold the heirs accountable for the difference. Any difference is forgiven entirely when the home is sold. It is common for adult heirs to be concerned about any inheritance that they may receive, and the way in which a reverse mortgage can affect it. Depending on the amount borrowed and the length of the loan, it is possible for there to be a significant amount of equity left over once the loan is settled. In looking at the larger picture, the main concern of both borrower and heir should be focused upon quality of life. A reverse mortgage can be instrumental in keeping those age 62 and older independent, comfortable and in their own homes. This alone can benefit their heirs immeasurably. Call Reverse Lineage Lending today and let us answer any questions about the reverse mortgage process.